Corky Siegel "Solo Flight 1975-1980"
Gadfly Records is proud to release "Solo Flight 1975-1980" a two-in-one re-issue of early solo works from harmonica maestro and bluesmaster general Corky Siegel. 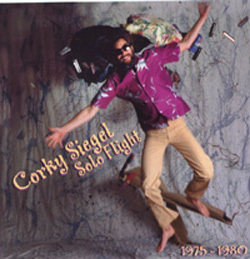 "Solo Flight" combines tracks from the "Corky Siegel" and "Out Of The Blue" LPs released in 1976 and 1981, respectively, following the temporary breakup of the legendary Chicago Siegel-Schwall Band, which Corky co-founded. In addition, there are two bonus tracks, which have never been released. Corky Siegel had a fortunate break at the age of 20 at the very start of his career when he formed the legendary Siegel-Schwall Band that toured the major rock palaces and clubs in the '60s and '70s. He was introduced to the blues through his first steady engagement -- at Peppers, the internationally renowned blues club where his job included performances with the blues masters themselves, such as Willie Dixon, Little Walter, Muddy Waters, and Howlin' Wolf. "For groups like the Rolling Stones ... names like Muddy Waters and Howlin' Wolf were exotic inspirations. For Siegel-Schwall they were the guys that played with them on 43rd Street." - Lin Brehmer - WXRT radio. Corky has recorded 17 albums, including five on Vanguard, five on RCA, two on Alligator Records (the exclusively blues label), two album projects for the prestigious classical label Deutsche Grammophon (DG), and most recently for the eclectic Gadfly Records. The DG release of William Russo's Three Pieces for Blues Band and Symphony Orchestra featuring Corky's blues band, Siegel-Schwall (for whom the work was written) with Seiji Ozawa and the San Francisco Symphony, was a blockbuster in sales and had "an unprecedented inter-generational impact on the American music scene." - (music critic David Sckolnik.) It prompted the only 45 rpm single release in Deutsche Grammophon's history, and the selection from the album scored high on the Billboard charts. Corky's solo recorded performance of William Russo's Street Music with Seiji Ozawa and the San Francisco Symphony on DG won the French Government's Grand Prix du Disque, and received the Recording of Special Merit in Stereo Review for the LP and again in 1988 for the re-released compact disc.